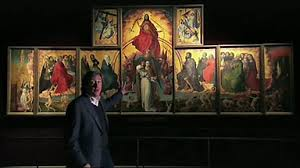 Andrew Graham Dixon is back on form with his latest art history programme for the BBC, The High Art of the Low Countries (loosely, the Netherlands and Belgium). His forays into Sicilian cookery were dumbing down; but now he is back doing what he does best, telling the story of human development – bad or otherwise – through the art produced at the time. Andrew Graham Dixon does what others tend not to do. He takes his time. He helps us to look at pictures. He guides us to the important symbols (fruit on the window ledge symbolising fertility, for example). In so doing, we not only learn how to read pictures, but learn how to use the pictures to understand the history they constitute. The first episode discusses Jan Van Eyck, Hieronymus Bosch and Rogier van der Weyden.